At Buckley, we transform the often difficult "middle school" years into an Upper School experience full of guided growth. Our oldest boys are given more freedom—and more responsibility—and as leaders of the School, they will emerge prepared and confident for a high school environment. ﻿Advisory. ﻿We recognize that every Buckley boy is different, and so in their Upper School years, we run an advisory program that pairs each boy with a faculty or staff advisor to help support him through the remainder of his Buckley journey. Advisors and advisees meet every Friday afternoon to catch up on the week over a game of cards or a milkshake at a local diner. The conversations are casual and supportive, and the advisors often become advocates for—and mentors to—the boys. ﻿Class IX. ﻿Since 1974, Buckley has had a Class IX program for those boys who want a year of academic and athletic leadership before heading off to secondary school. 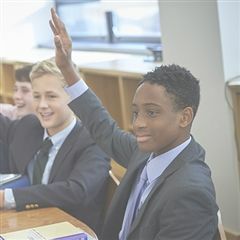 With an average class size of only thirteen boys, Class IX offers a competitive curriculum equal to or exceeding the freshmen program at many secondary schools and allows the boys to grow as leaders of Buckley's various student-run initiatives, including the Student Council, the literary publications, and the community service efforts. Class IX takes advantage of the small number of students to explore New York City on a local field trip every other week and to travel to Boston and Washington, D.C., in the fall and spring. Our boys who elect to stay for Class IX often enter high school exceptionally prepared for a rigorous academic curriculum and have an immediate impact as community leaders. Secondary School. ﻿We recognize that boys will change throughout their nine or ten years at Buckley and that they will need guidance and support in order find the right secondary school for the student they have become. As a result, we take secondary school placement seriously, advising our Class VIII and Class IX families throughout the process. As a former director of admission, Headmaster Greg O’Melia plays an active role in overseeing the process and advocating for our boys, along with the director of placement and the director of the Upper School. 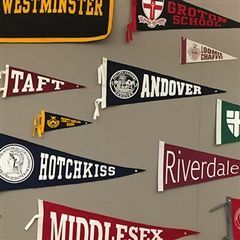 Buckley boys are consistently admitted to a wide range of boarding and day high schools, including Andover, Bronx Science, Choate, Collegiate, Deerfield, Friends Seminary, Grace Church, Groton, Exeter, Horace Mann, Hotchkiss, Lawrenceville, Milton, Packer Collegiate, Regis, Riverdale, St. Paul's, Stuyvesant, Taft, Trinity, and Westminster.